RAID stands for Redundant Array of Inexpensive (Independent) Disks. RAID-1 is also known as striping. RAID-1 required minimum two disks. The max data on RAID-1 can be stored to size of smallest disk in RAID array. In this article we are using CentOS 6.5 running with VMWare. 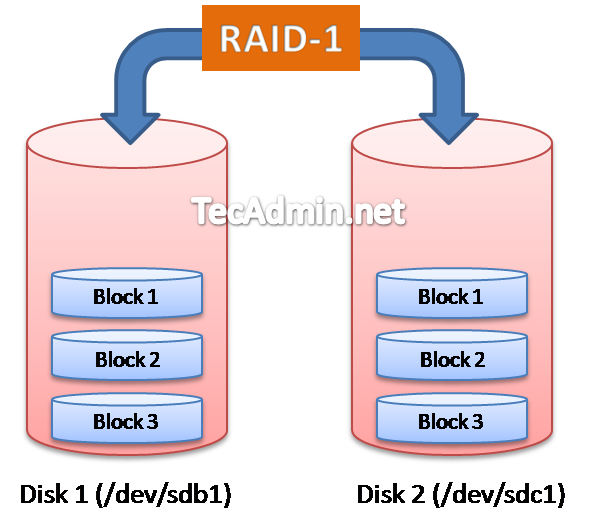 I have added two virtual disks as /dev/sdb and /dev/sdc for configuring RAID-1 partition. Each disk size is 10GB and we will one partition on both disks of 5GB which will created as /dev/sdb1 and /dev/sdc1. Know few things about RAID-1 as below. Cons – Storage overhead, required disk size if twice of data. Warning: Be careful while implementing RAID on system, In this tutorial you are going to use fdisk and mkfs command. Before doing it make sure you have taken backup of data on some remote backup disk. Firstly we are going to create logical partitions on both newly attached disks as /dev/sdb and /dev/sdc and will change system type of partition as Linux raid autodetect. Building a new DOS disklabel with disk identifier 0x9452ab46. Lets verify that you have created partitions correctly and they are of type “Linux raid autodetect“. In the below outputs we can see that /dev/sdb1 has been created in /dev/sdb disk and /dev/sdc1 is created on /dev/sdc disk. In the above command –level defined as 1, which shows that we are create RAID-1, –raid-devices defined as 2 which shows that we are adding 2 drives in RAID, and /dev/md0 is used for device name. To view full description of an RAID device run command as below. This command will show you the detailed information about defined RAID Array. To mount it permanently after system reboot make entry in /etc/fstab file as below. Also create the Raid configuration file by using following command, This command scan all raid arrays on system and add an entry in /ettc/mdadm.conf file.